We all know that Santa brings presents to good boys and girls on Christmas morning - but in our family we also give gifts to each other. I knew my grandson Taylor was fascinated by the Titanic. He knows more about the Titanic than most adults never mind other 5 year olds. If you inquire, he'll tell you all he knows about it, and then continue onto the USS Arizona, and Captain Sully landing in the Hudson. He loves a good transportation disaster. 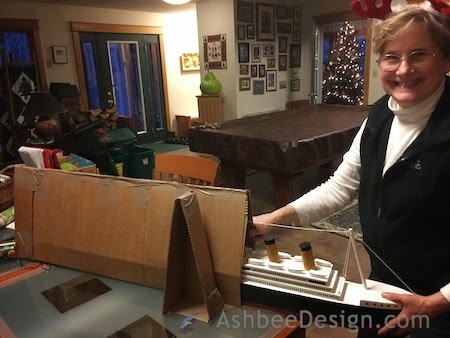 I decided to build him a Titanic like no other as his Christmas present from his Zee Zee (me ) and his Papa. 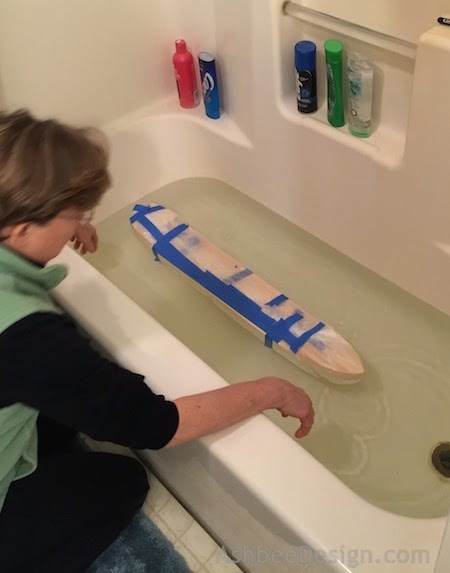 She is about 34 inches long and does float although there isn't much space left for Taylor in the bathtub! 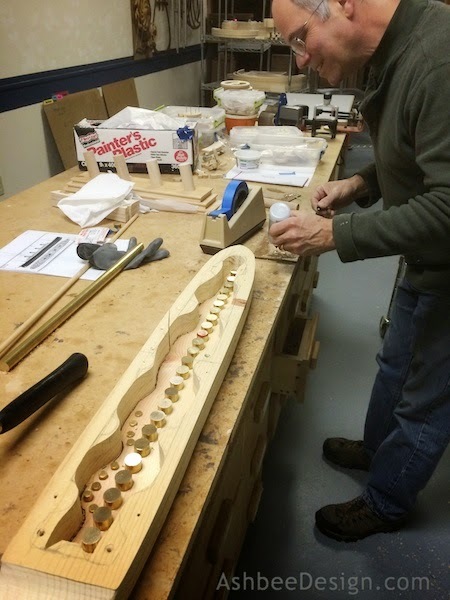 This project was mainly mine as David was working to get his sculptures out, but he generally allowed me to work in his shop and several of the trickier tasks plus wonderful advice were all his. 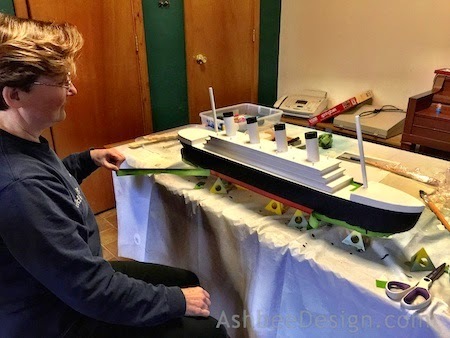 This blog post is not meant to be a tutorial although if you want to build your own Titanic, it will help show you how we did it. This is more as a story for Taylor so he can see how his Titanic was built. I started with a Google search of Titanic images. 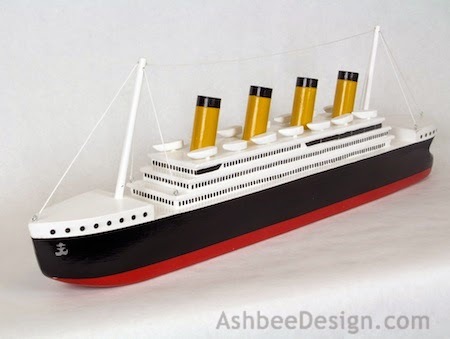 I knew I would need to simplify but I wanted the toy to have the essence of the Titanic. Working on the computer, in Illustrator, and at full scale, I drew up my plan. 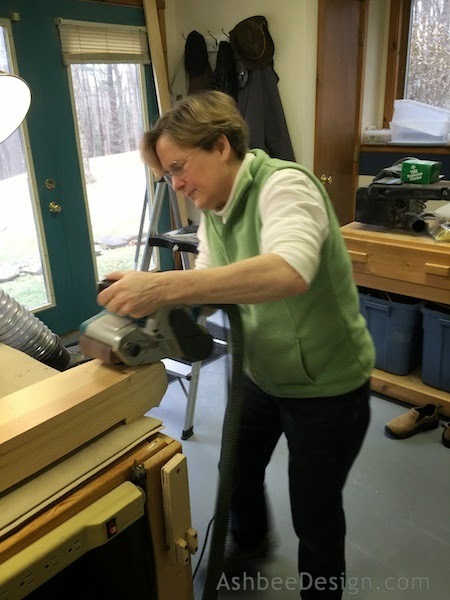 I had also reviewed my wood supply and knew what thicknesses of wood I could use. 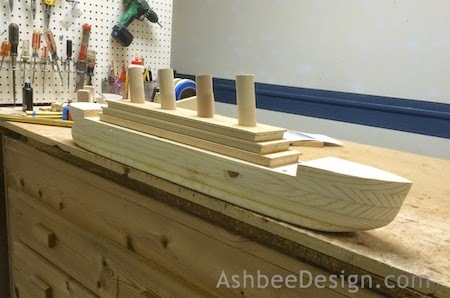 I made the hull from stacked 3/4" pine and the cabin stack is from 5/8" pine with routed edges. I printed out the top view and glued that to the stack of pine which I had stacked and screwed together. 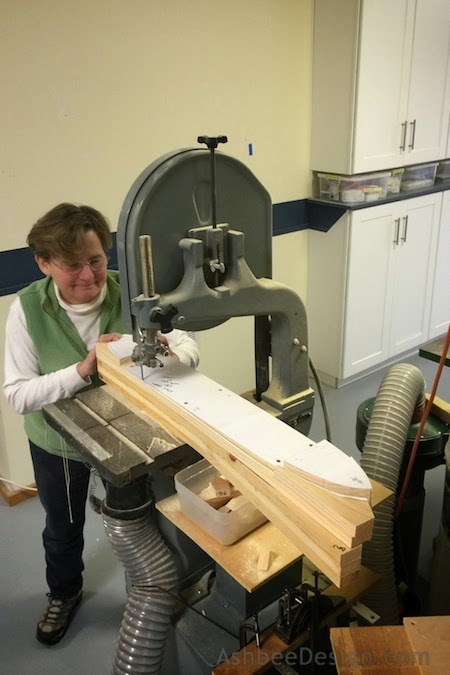 The hull is four layers of pine. 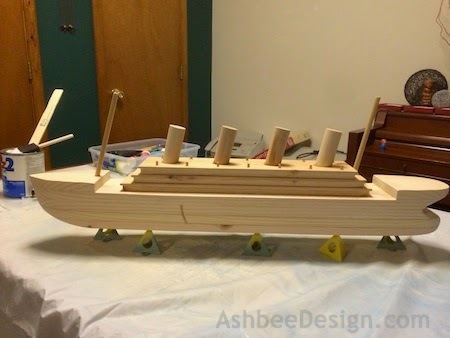 I added another level and the bow and stern for the raised deck areas. 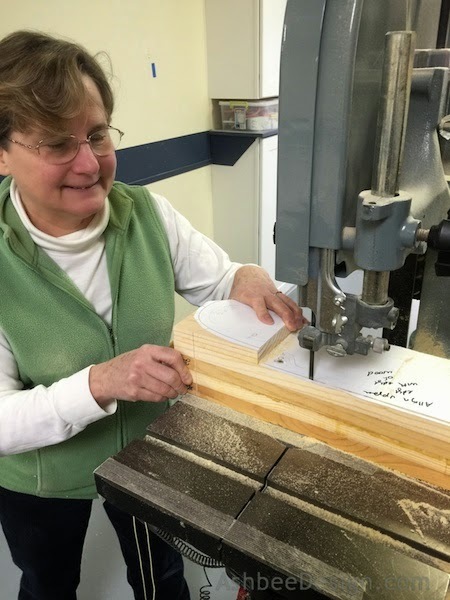 Working on a band saw, I cut the outside contour. 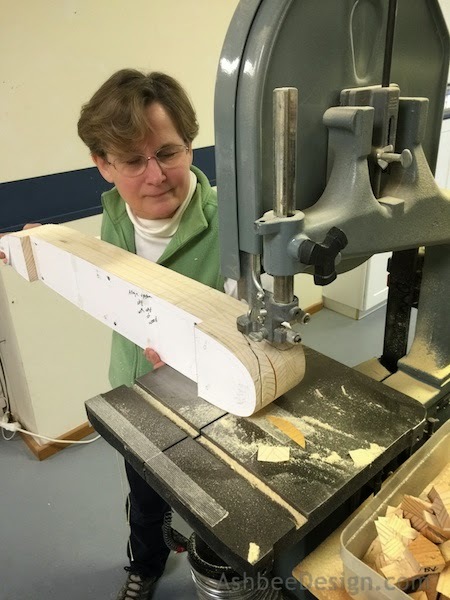 I then shaped the stern on the band saw. 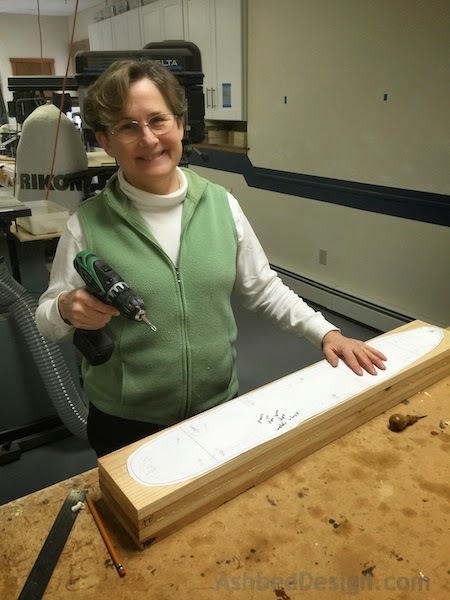 I spent a good amount of time hand shaping the hull using a belt sander. 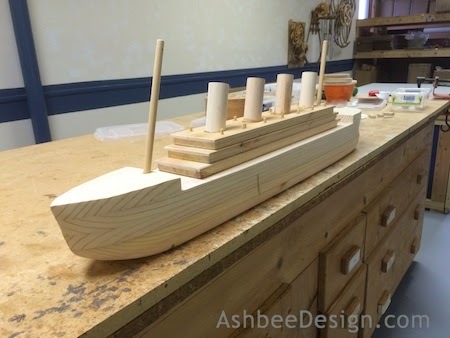 The sides were tapered and the bow and stern were sculpted. After much sanding, I unscrewed the hull and decided how I would cut out the center of the middle layers. I knew if this boat was to stay upright it would need to hollow and ballast would need to be added. 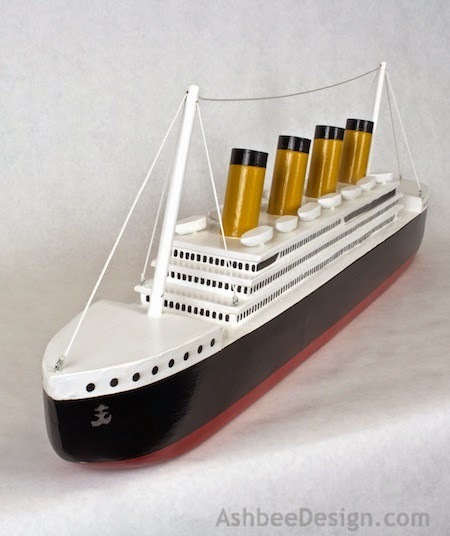 This Titanic has no keel on the bottom because it is a toy to be played with on the floor or in a tub. The bottom had to be flat. David and I knew we would need to experiment with ballast to make this ship float! Step one was hollowing out the hull. 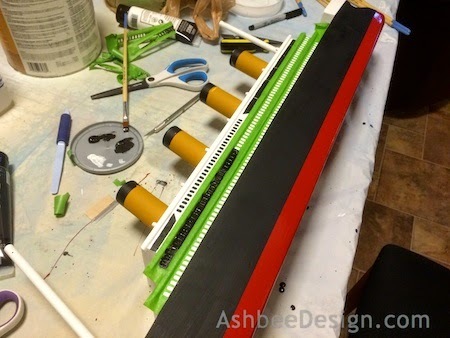 I cut out the center of the hull and screwed the layers back together. Meanwhile, David was helping with the upper decks. The upper decks are 3 more stacks of pine, each slightly smaller than the previous. 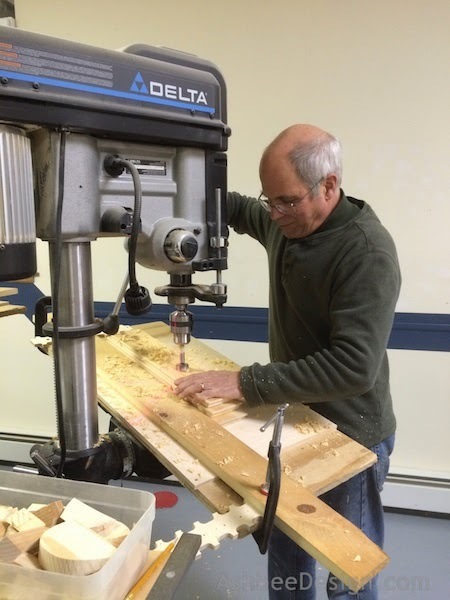 David routed the edge to create the over-hang at each level. 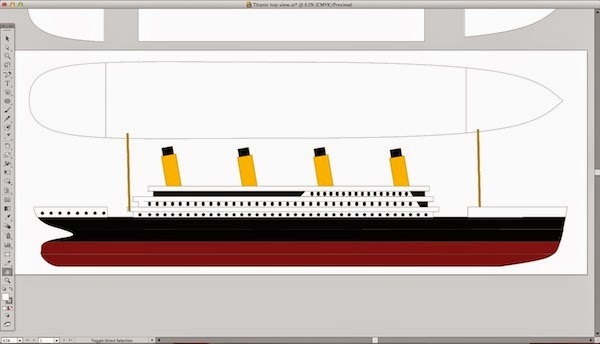 One of the important identifying features of the Titanic is the slant of the four smoke stacks. 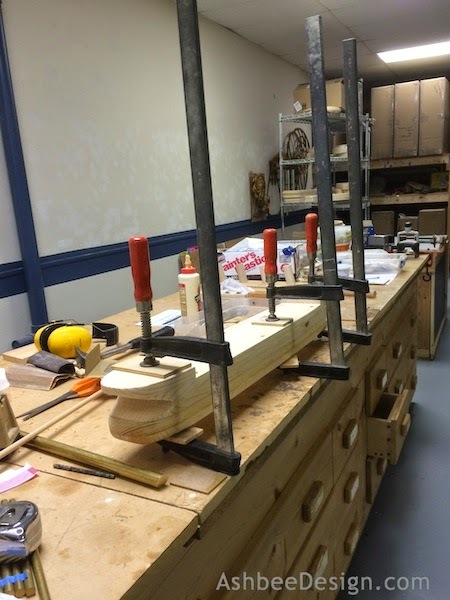 David created a jig on the drill press and drilled the holes for the stacks made from dowels. 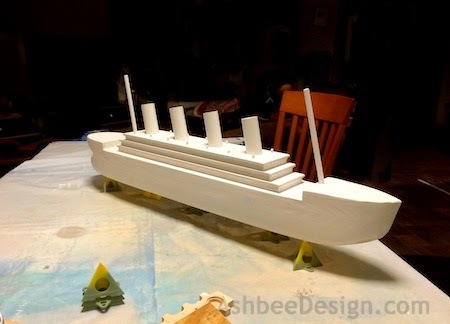 Here is the Titanic with all basic construction completed. 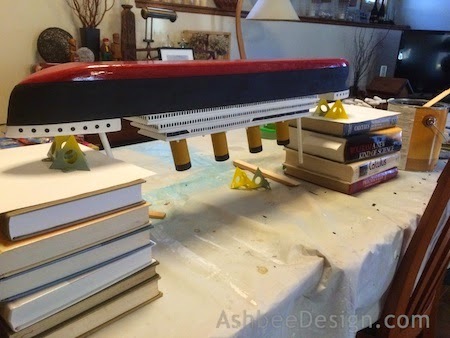 The hull is still only screwed together because we need to have float tests and determine how much weight needs to be added to the hull. 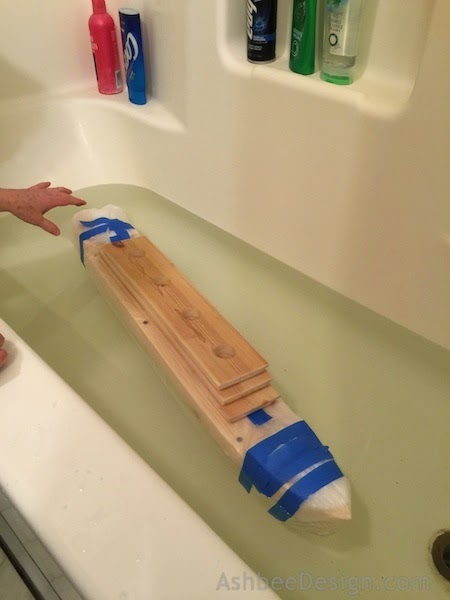 We wrapped the hull in plastic and tried the first float test. 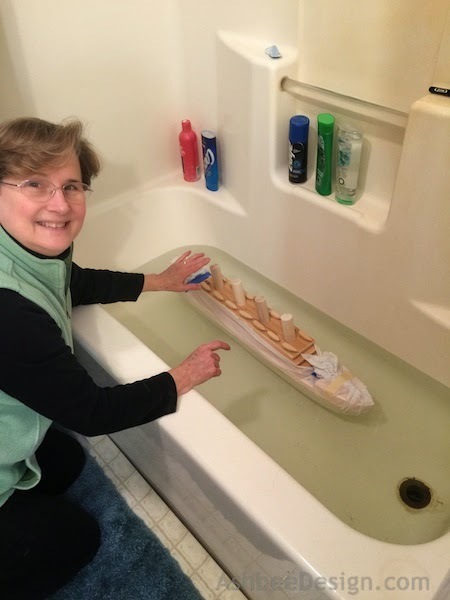 We started with just the hull and were thrilled because it floated! We then added the upper decks and it was no longer stable. It wanted to tip over although still floated. Back in the shop we started adding ballast to make the bottom heavier. We place a couple of brass rods in the hull and determined how much it would take to keep the boat upright. We then cut the brass rod into brass slugs and drilled holes into the hull bottom on the inside. Right up the center of this ship is a row of brass slugs. After this step we again wrapped the ship in plastic and tried another float test. 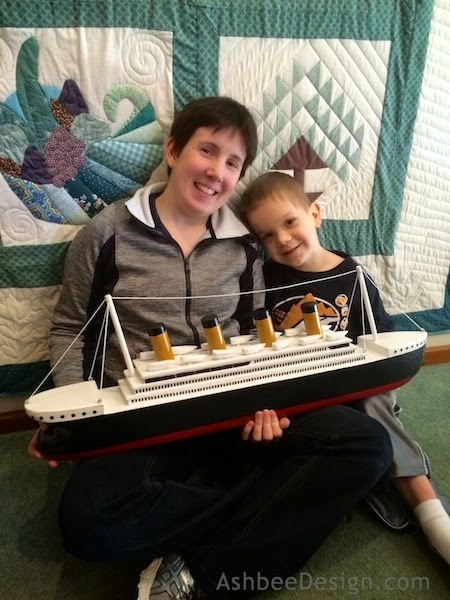 The Titanic continued to float and this time didn't capsize, but she was listing to one side. We added a series of smaller brass weight to the port side to offset the list. Once we had her floating well, we glued all the weights in place. At some point I also made the life boats. 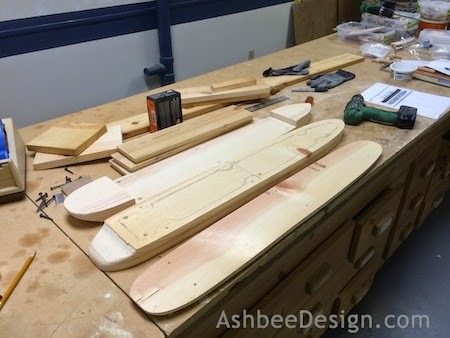 Each was shaped using a belt sander from a small 1/2" dowel. 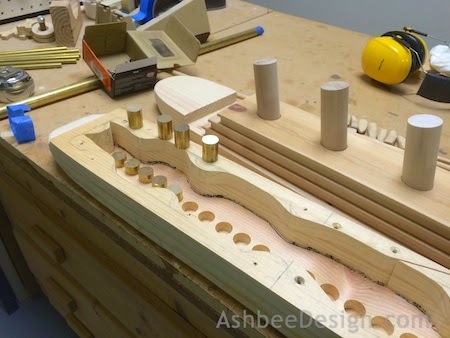 All are held in place with a small dowel. The life boats can be lifted off and floated as well. We had an additional series of float tests. 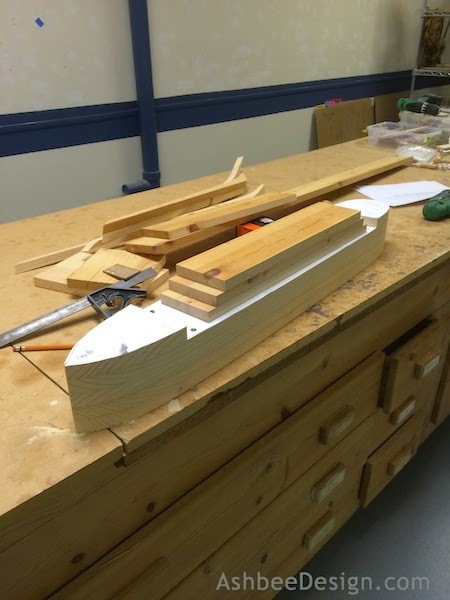 We had to wrap the hull in plastic because the wood was still raw without finish. It would soak up the water. 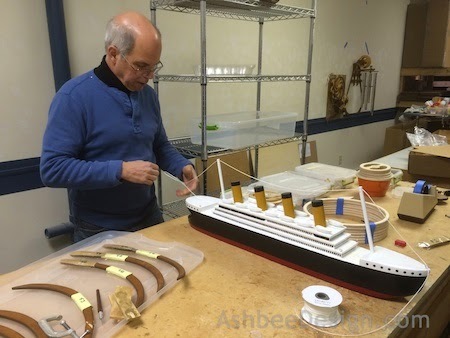 Once the Titanic was floating well, it was time to glue her hull together. 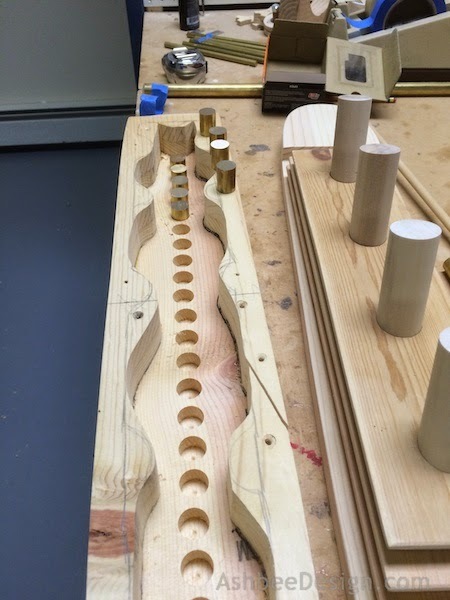 It all came apart and glue was added between all layers. 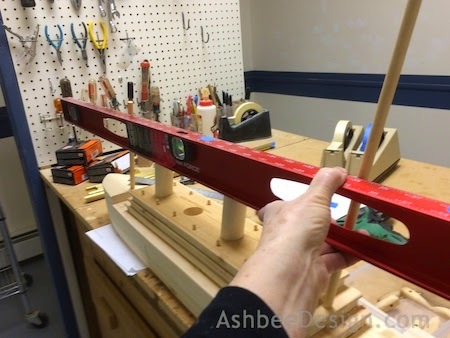 The layers were placed together and the entire hull was clamped tight and allowed to dry. We had hollowed out the upper decks and glued those on as well. We determined the angle of the smoke stacks to add the fore and aft masts. I took a little artistic license here and made these masts much heavier than on the original in hopes they would stand up to play. 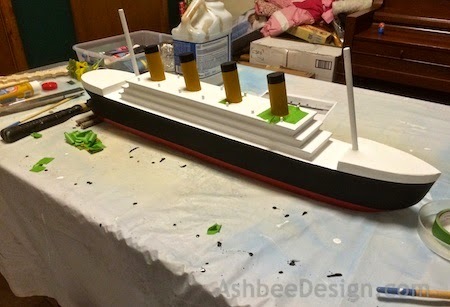 Here she is with the masts added and all the smoke stacks glued in place. 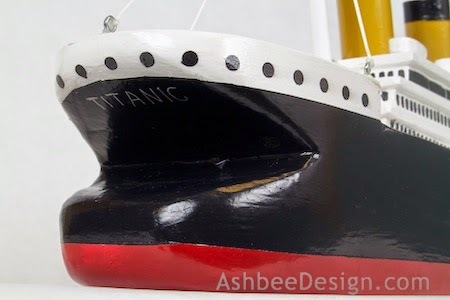 I then moved the Titanic to the "paint shop". She was going to need many, many coats of paint and be allowed to dry between each. I set her up in a location for painting. First came 3 coats of white primer. I then used Frog tape and taped off the bottom of the hull. That received 3 coats of shiny red paint. The taped help create a nice clean line. I again added more Frog Tape, this time to outline the black areas. 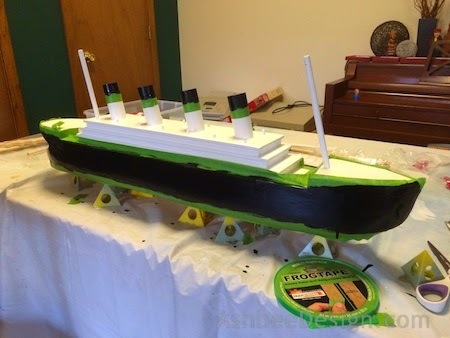 And the Titanic got 3 coats of black paint. I loved peeling off the tape because with each added color she looked more beautiful. The last color added was the ochre of the smoke stacks. I wasn't exactly sure of the color of the smoke stacks because all the original photographs of the Titanic were black and white. The artist's drawings had a variety of yellow and orange shades for the smoke stacks. I choose a yellow orange. The painting of the windows was time consuming. I made stencils in the Frog Tape using my Silhouette cutting machine. That helped but I also spent hours touching up the edges. 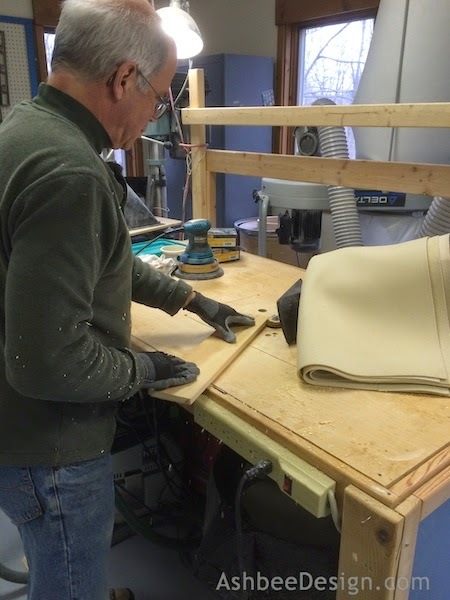 The last coats were 3 coats of polyurethane over all sides. 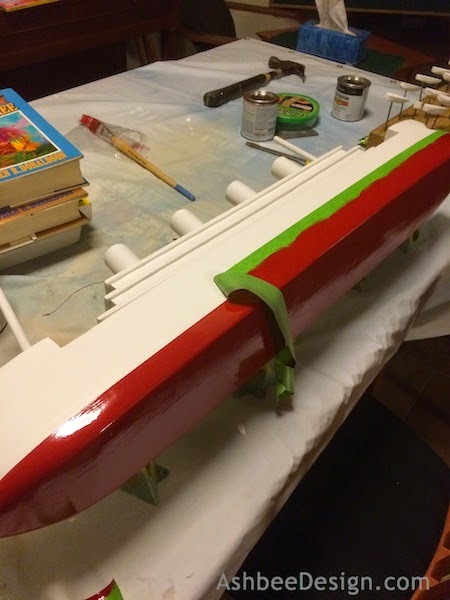 The Titanic rested upside down as I coated the hull. And here is her maiden voyage, complete with paint! She then went back to the shop to have her rigging added. Boxing her for Christmas wrapping was a challenge. Papa made a triangular box just the right size. Taylor started opening it and peaked in the front. Just from a quick peak of the bow he knew it was the Titanic and had to stop unwrapping to jump up and down with excitement. A little later Christmas morning Taylor showed us that there is plenty of space for both the Titanic and a five year old boy in the tub at the same time. Merry Christmas, Taylor and Bon Voyage! what a fantastic work!!! Thank you for sharing. Have a happy new year! Thanks. I am overjoyed with how it came out. Happy New year to you as well! This came via my email from Janie who had trouble getting Google comments to work. I am giving it a try now. WOW! 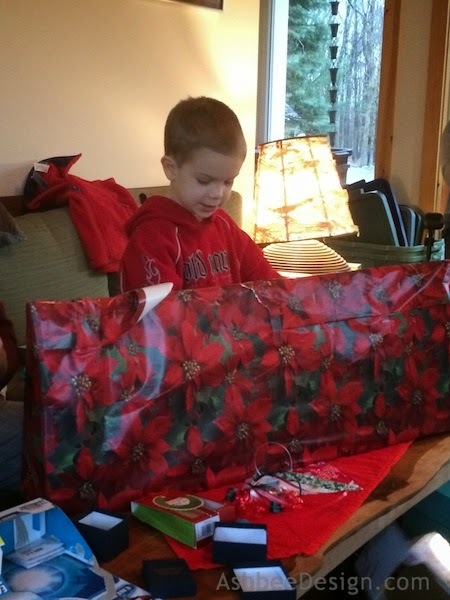 Taylor is a lucky little boy to get such a wonderful "toy" and keepsake made by his grandparents. This is certainly a forever gift. 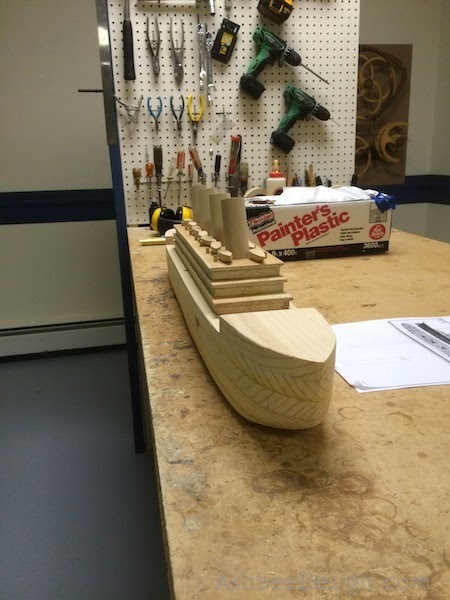 When he's 90, he can tell his grandchildren how this ship replica came to be his. I'd keep this post as documentation for the history he's bound to want to know someday. What thoughtful people you are. Janie, I made the blog post especially for Taylor. 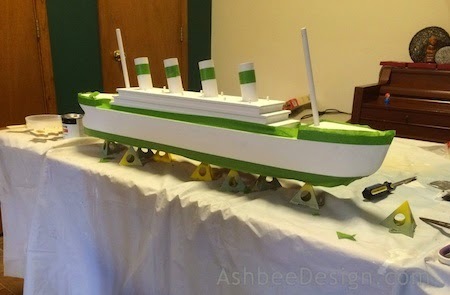 I hope he will be able to share the Titanic with his classmates and that the teacher can use the blog post to help the kids see the construction. Not sure though. Many schools don't have "Show and Tell" anymore but I expect something should be able to happen and still be a teaching moment. Thanks for your warm comments. Oh wow, what a treasured gift that will be. Such talented people. 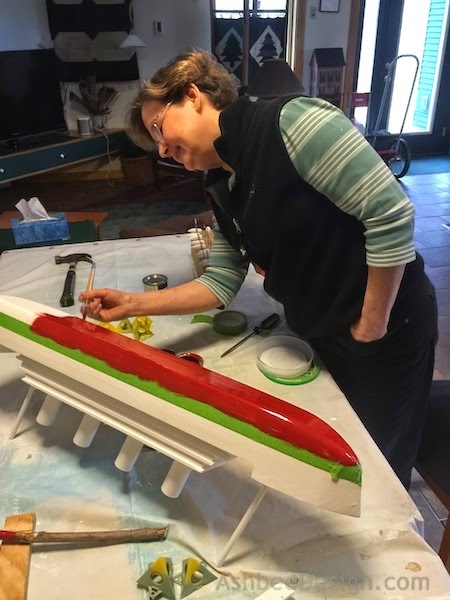 Thanks for sharing the photos and story on how your Titantic was created. Just wonderful. Happy New Year to you and David. Thank you Merry. My blogging has really dropped off as I have expanded my paper work and my other blog. Miss the comments here. Nice to hear from you and all the best for your New Year as well. Books are good, also. 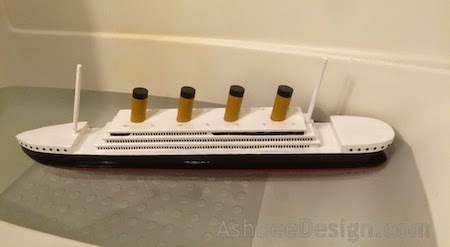 But I think he has all the Titanic ones already :-) At least I din't have to make a birthday cake. That is an area I have limited ability at! Is there any way to contact you directly?? I think I have a very interesting product that may open up many opportunities for new projects.